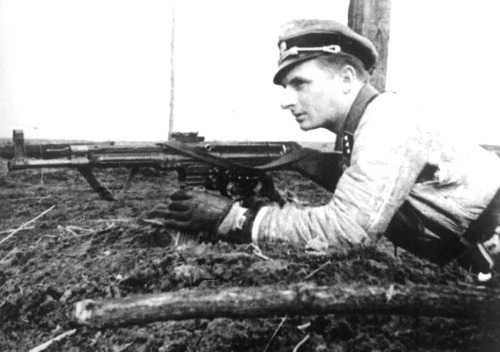 The StG-44 assault rifle was probably the most advanced German infantry firearm of WWII. 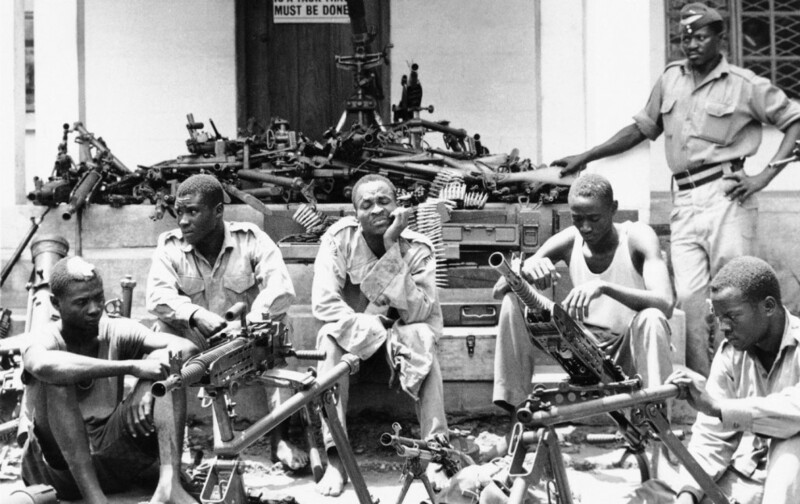 Surprisingly, some of these weapons ended up on the continent of Africa after WWII. The StG-44 is regarded by many to have been the world’s first true assault rifle, as the term is understood today. It combined the range of a rifle with the rate-of-fire of a submachine gun. The StG-44 (StG meaning Sturmgewehr or storm rifle literally, but meaning assault rifle) entered service late in WWII. It weighed 11 lbs and was 3’1″ long. Officially, 425,977 were built during WWII. The actual total may have been slightly higher. The StG-44 fired the 7.92x33mm Kurz cartridge from a 30-round magazine. This cartridge filled it’s role well. The standard Wehrmacht cartridge, the 7.92x57mm Mauser, would have been too powerful to control in full auto, while the 9mm Parabellum would have been too puny for long-range engagements. The 7.92x33mm (Kurz means short in German) was an excellent intermediary combining the best features of both. Muzzle velocity was 2,247fps and the StG-44 was accurate out to 300-500 yards. The StG-44 was an excellent weapon which simply came too few, too late to make any difference in WWII. During the 1954-1962 French war in Algeria, the communist bloc provided covert aid to the Algerians. One of the more surprising captures by the French army was a number of StG-44s. Contrary to some more romanticized accounts, the Algerians did not discover long-lost caches from Rommel’s WWII Afrika Korps, as no StG-44 had ever served in any German unit in Africa during the war. Rather, these guns had arrived to Algeria via Czechoslovakia. When WWII ended in 1945, the Soviet army retained and stored every StG-44 it found. By best estimate, in 1948 there were about 102,000 StG-44s in Soviet custody. 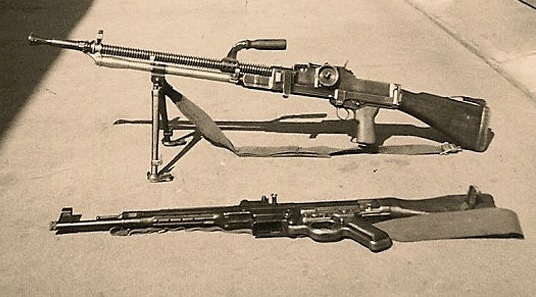 As the SKS and AK-47 were already entering Soviet use, the captured StG-44s were not issued to Soviet units but rather made available for transfer abroad, with Czechoslovakia being the first and main recipient, followed by East Germany. Hungary also received a small (about 4,000) batch, and Yugoslavia also received some prior to it’s split with the east bloc. These joined StG-44s captured by the Yugoslavs themselves. Finally the Soviets transferred a few to North Vietnam; these in turn were joined by more transferred from Czechoslovakia and East Germany (which themselves had come from the USSR) as those two countries phased the type out. The Czechoslovakian army began using the StG-44 in 1946 and by 1949, it was one of the country’s main battle rifles. In 1950 it began to be phased out to storage or passed to other users (primarily East Germany and North Vietnam). It was gone from frontline Czechoslovakian service by 1955 however several thousand still were in storage. 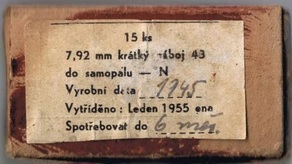 Czechoslovakia was also the main nexus for Kurz ammunition after WWII. Czechoslovakia itself had secured a decent supply inside it’s borders when WWII ended in May 1945. Beginning in 1946 and running for about ten years, Czechoslovakia was also used by the Soviets to repackage German-manufactured, WWII-vintage Kurz rounds which had been captured by the Soviet army in quantity sizes ranging from factory truckloads to 900-round crates to individual loose rounds. Finally, Czechoslovakia manufactured new-production Kurz rounds, both for it’s own use and to an East German contract. In particular, the Sellier & Bellot company in Vlasim was heavily involved in the repackaging program. A Sellier & Bellot box which the Czechoslovakians had forgotten to remove the label from is what allowed France to pinpoint the source of the rebel Algerian StG-44s. For certain, Czechoslovakia had no interest in the outcome of France’s colonial war in Algeria. The USSR used the Czechoslovakian arms industry as a proxy for it’s international meddling throughout the Cold War when it did not want to be directly indicted. By intent or neglect, the Czechoslovakians never kept detailed records of how many StG-44s were shipped to Algeria. The total was probably not large, as it was not frequently encountered by French soldiers there. It was not a real factor in the war. When the country became independent on 5 July 1962, a few may have briefly been used but there are no records of the StG-44 in formal service. In any case, by the mid-1960s the Algerian army had re-equipped with Soviet weaponry and for certain, any remaining StG-44s were gone. In 1969, General Mohamed Siad Barre overthrew the government of Somalia and established a military dictatorship aligned with the USSR. One of Barre’s main rallying points was to incorporate the Ogaden region of Ethiopia, which had a significant ethnic-Somali population, into Somalia. In the early 1970s, Barre went on an arms-buying spree to re-equip his army. This was largely underwritten by the Soviet Union, which had established a massive military presence in Somalia including a bomber-length airfield near Mogadishu and a naval complex at Berbera which could accommodate nuclear submarines. The Soviets had planned that Somalia would act as the southern “jaw” opposite South Yemen (itself a Soviet puppet) which would choke off the Red Sea and threaten the western part of the Indian Ocean. Somalia was also backed by Egypt, which wanted to destabilize Ethiopia and safeguard North Yemen. 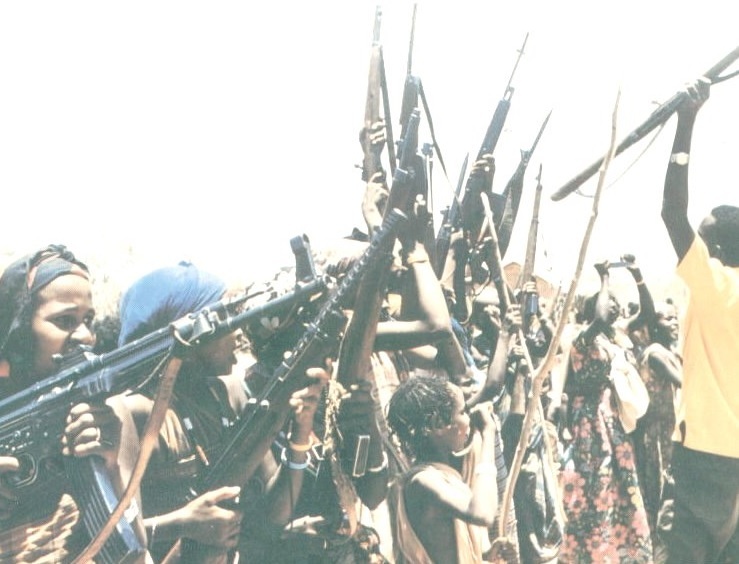 On both sides of the border in the Ogaden, a pro-Somali rebel group called the WSLF (Western Somali Liberation Front) was operating. Initially with 1,500 fighters, it grew to 3,000+ in several years. It was equipped with all manner of cast-off weapons, including StG-44s. The WSLF was armed with whatever castoffs could be found, including the StG-44. The origin of Somalia’s StG-44s in unclear. Most likely they came from East Germany. Another (less likely) possibility mentioned was Egypt, as the Egyptian army received a tiny (and unwanted) shipment of StG-44s from Czechoslovakia after the Six Day War which were never put into service. As the WSLF kept no records, the total number in use is unknown but probably small. Trying to find ammunition for the StG-44 in the late 1970s must have been extremely difficult. There was probably some still in the Czechoslovakian stockpile, and East Germany had manufactured it until 1962 and retained it in reserve until at least about 1969. Egypt very briefly manufactured it, but not in any great quantity. Yugoslavia actually never manufactured it, as it’s reboxed supply of ex-German WWII leftovers was so large that it lasted the StG-44’s entire Yugoslav career until the gun’s retirement in 1983. Yugoslavia also charged fair market prices for military goods, unlike East Germany or the USSR which considered it “communist solidarity”. In all likelihood, both the rifles and the ammunition in Somalia were by way of East Germany. In 1974, the emperor of Ethiopia was overthrown by a military junta called the Derg. Somalia saw an opportunity as Ethiopia was in chaos after the coup. The WSLF stepped up activities in 1975 and 1976. 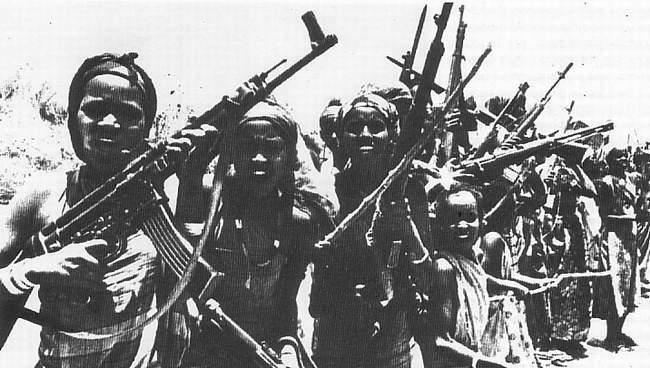 At 03:00 on 13 July 1977, Somalia launched a massive invasion of Ethiopia, aiming to conquer the Ogaden region. 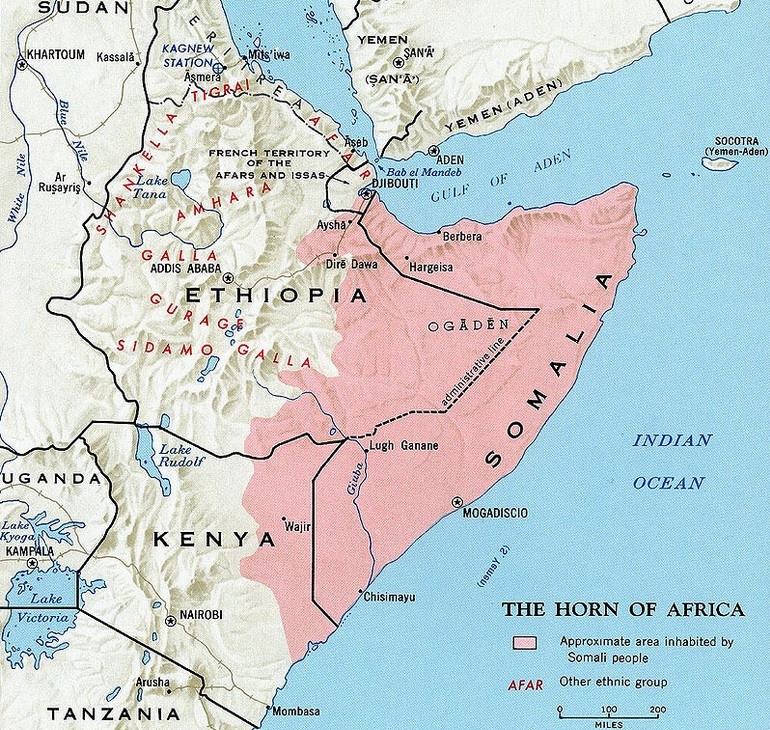 By the end of 1977, Somalia had occupied most of the Ogaden. However the USSR, which was allied with both Ethiopia and Somalia, decided it could not support both countries at once and abandoned Somalia mid-stream. At the same time, a joint Soviet-Cuban emergency effort reinforced the Ethiopian military. Modern MiG-23 “Flogger” and Mi-24 “Hind” aircraft were shipped from the Soviet Union, and 11,000 Cuban troops arrived to help the Ethiopians. Somalia was now in a bad position as all of it’s military aid had vanished, while it’s enemy’s more than doubled. The Ethiopians gradually pushed Somali forces back. On 5 March 1978 Somalia suffered a massive defeat at Jijiga and about a week later, all of it’s forces were pulled out of the Ogaden. The WSLF was destroyed along with it’s StG-44s. 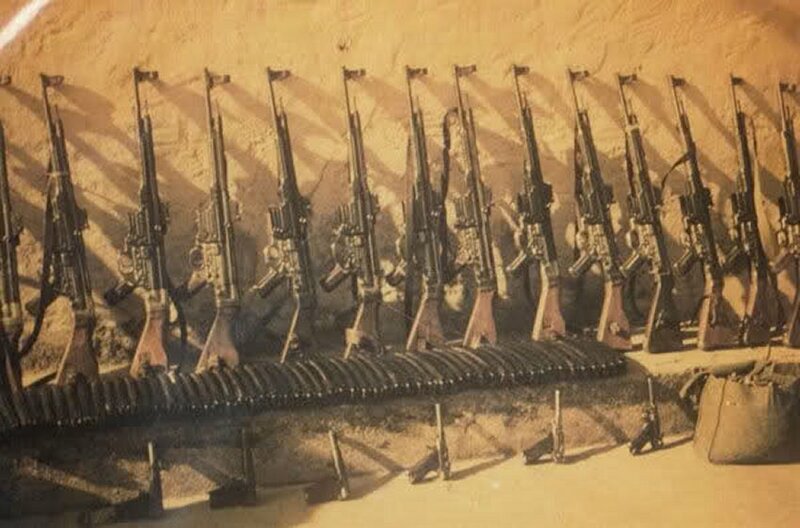 The StG-44 made one other appearance in Somali service. At the same time the WSLF was antagonizing Ethiopia, a much smaller Somali group called FLCS (Liberation Front of the Somali Coast, in French) was trying to rile up a small pocket of ethnic Somalis inside southern Djibouti, with the aim of annexing that region (or even all of Djibouti) to Somalia. During 1976 they made several forays into Djibouti including a hostage crisis in February 1976 which was stopped by officers of the French Gendarmerie. 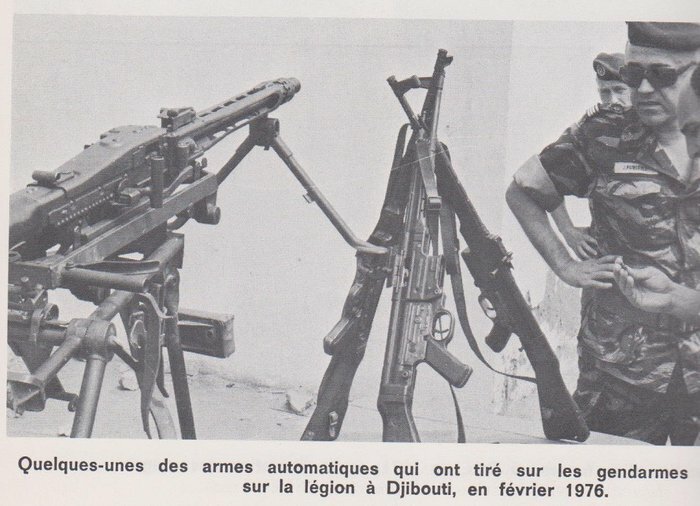 France sent a Foreign Legion unit to Djibouti to prevent further problems and the FLCS and it’s StG-44s faded away, having accomplished nothing. 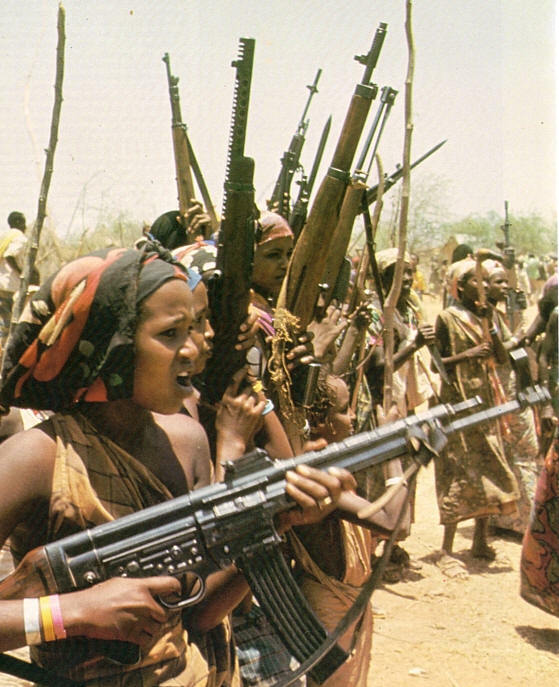 The end of the Ogaden War was also the end of the StG-44 story in Somalia as none were ever seen there afterwards. Nobody realized it at the time, but Somalia’s defeat in 1978 was also the beginning of the end for Somalia as a functioning country. The war shattered the Somali army and bankrupted the national treasury. Starting in the early 1980s, local clans and warlords began to increasingly ignore Barre’s rule. In 1990, the government collapsed altogether and the country entered it’s current state of anarchy. What will most likely be the final appearance of the StG-44 in Africa came in 2013. A small number (including one unused in it’s original Wehrmacht crate from WWII) were seized from anti-government rebels in the impoverished, landlocked country of Burkina Faso. The origin was not pinpointed but most likely, the StG-44s were ex-Yugoslav by way of Libya. In 1983, as the Yugoslav army finally retired the StG-44, a small lot was sold to Muammar Gaddafi’s Libya along with some WWII-dated ammunition. Gaddafi had a tradition of buying weapons the Libyan military neither needed nor wanted and all of the StG-44s went straight to storage. It is thought that the StG-44s which ended up in Burkina Faso had been looted during the Libyan Civil War and found their way south via desert nomads in the Sahara, who often use obsolete rifles as a form of currency. They did not come from Syria, as the StG-44s there were used by the rebels who captured them. The last picture ( burkina Faso 2010 ) actually shows the same women as in the Ogaden war pic in color!!!! That is actually the last photo in that section. The Burkina Faso pic is the rifle with the nation’s flag. And it’s not over yet… a Texas gun manufacturer is making a modernized version, the StG-N, chambered in 7.92k, 7.62×39, 5.56 NATO, and .300 Blackout. (see videos on YouTube for details). THE SIG-44 ASSUALT RIFLE COMING TOO LATE WW2. BUT MAYBE IN THE COLD WAR WAS USED. FOR PSEUDO FORCES.